I’ve got a collection of classic arcade games from the ‘golden era’ of the early 1980s. They’re not the whole wooden cabinets with flickering lights and cigarette burns, but just the circuit boards from inside. They are easy to store and easy to plug in to a joystick and monitor to play. However, some of them have always been a bit tricky to see. 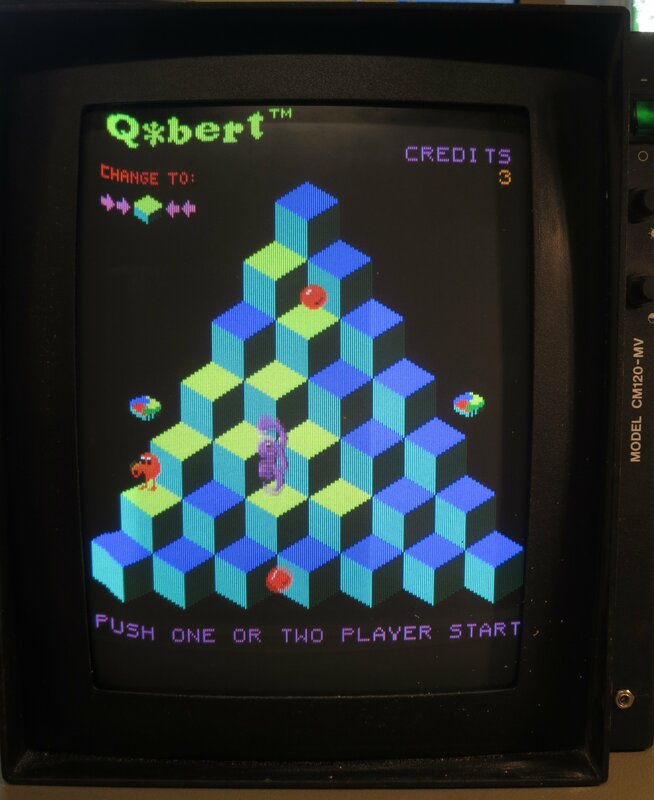 The monitor I use, a spiffy Microvitec bought surplus from Display Electronics in 1990, has fantastic picture quality but is a bit fussy about its input signal. Specifically, it seems to expect that the sync pulses – the bits of the signal which indicate where lines and pictures start – must conform more-or-less closely to broadcast standards. Unfortunately, the people who designed the old video games weren’t too worried about complying with standards. 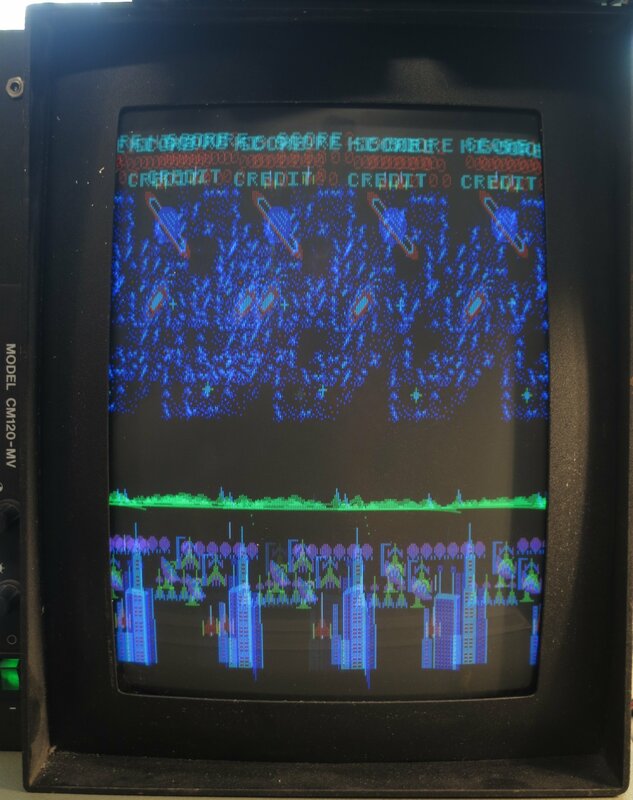 The result is that, on my monitor, some games tend to flicker and roll, or require very finnicky adjustment of the controls. There’s loads of information about what video sync pulses are supposed to look like on the web. This link has plenty of detail. However, the important things here turned out to be that the horizontal sync pulses should be fairly close to 4.7 microseconds long, and the vertical sync pulses should be pretty much three lines, or 192 microseconds, long. 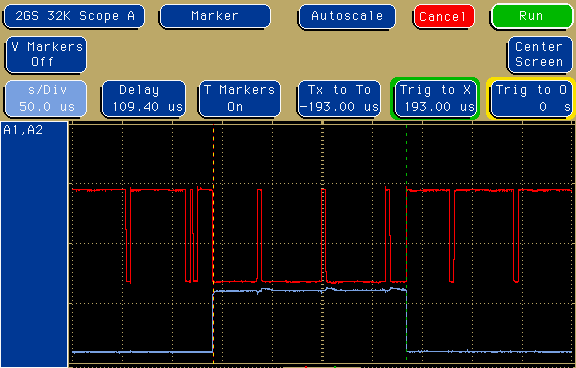 In all the scope pictures, the red trace is the sync output from the game, and the blue line is the vertical sync from my electronics which I’m just using to trigger the scope at the right time. In this case, the narrow red pulses are the horizontal sync pulses, and the broad area between the dotted lines is the vertical sync pulse. It’s six lines, or about 386 microseconds, wide, which seems to be good enough to keep the monitor happy. Oh dear, It’s only 3 microseconds wide when it ought to be 4.7. And the vertical sync pulse? That’s as stable as I could get it. Notice how the left hand side (which is actually the top – the monitor is rotated 90 degrees) is curved and wobbly. It was fairly hard to adjust the monitor to get the picture stable enough to take a photo. There are solutions to these problems which involve modifying the game boards themselves, but I didn’t want to do that. I think they’re interesting historical artefacts (even the bootleg ones) and I try to keep them as original as possible. I wanted to fix the sync problems outside the board. After a bit of experimenting, I came up with a little circuit which regenerates the sync pulses to be a bit more standard. 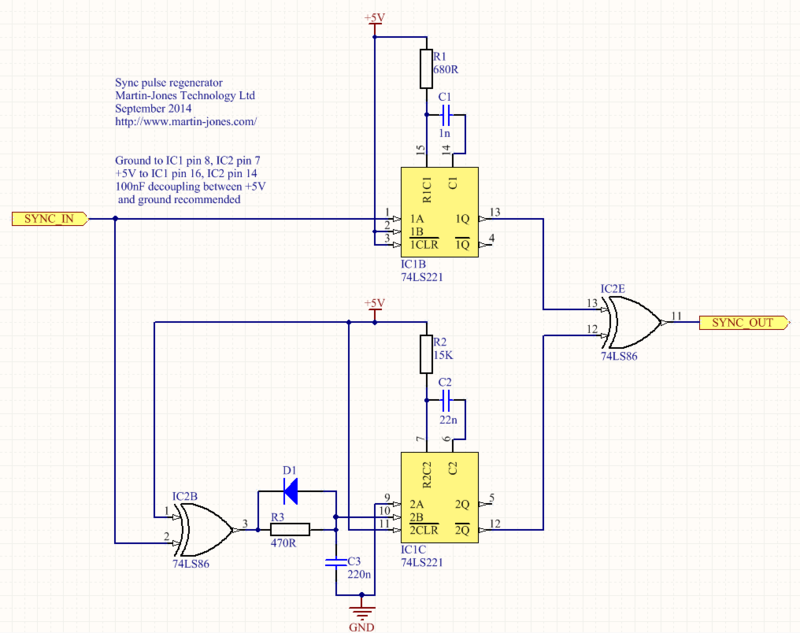 The circuit is simple and cheap, using two standard TTL logic ICs. It ought to work with 74HC series chips as well, but some of the resistor values might need changing. The diode is any common-or-garden signal diode: a 1N4148 or 1N914 is fine. It works like this. IC1B is a monostable which triggers on every sync pulse, generating a pulse 4.7 microseconds long. These become the new horizontal sync pulses. IC2B combined with D1, R3 and C3 form a sync separator which triggers the monostable in IC1C only on sync pulses which are longer than about 40 microseconds. IC1C is a monostable which generates vertical sync pulses about 200 microseconds long. IC2E combines the new horizontal and vertical sync pulses into a new sync signal. 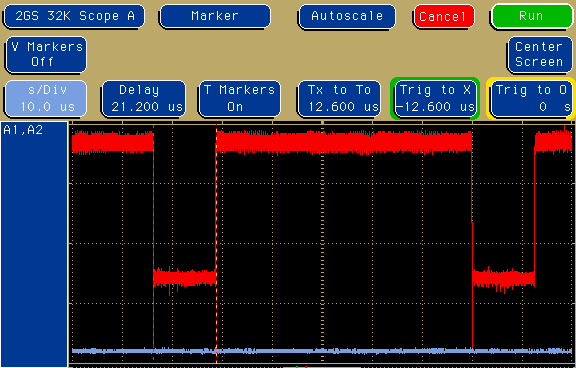 Nice horizontal sync pulses, with a vertical pulse 193 microseconds long. There are a few extra pulses around but the monitor doesn’t seem to mind. The vertical sync pulse is a sensible length, but there’s a long pause after it before the horizontal pulses start again. That doesn’t bother the monitor, though, and all the wobbles have gone away. Here’s the test setup in use. Sorry about the mess, but at least the display on the monitor is tidy. Mission accomplished. 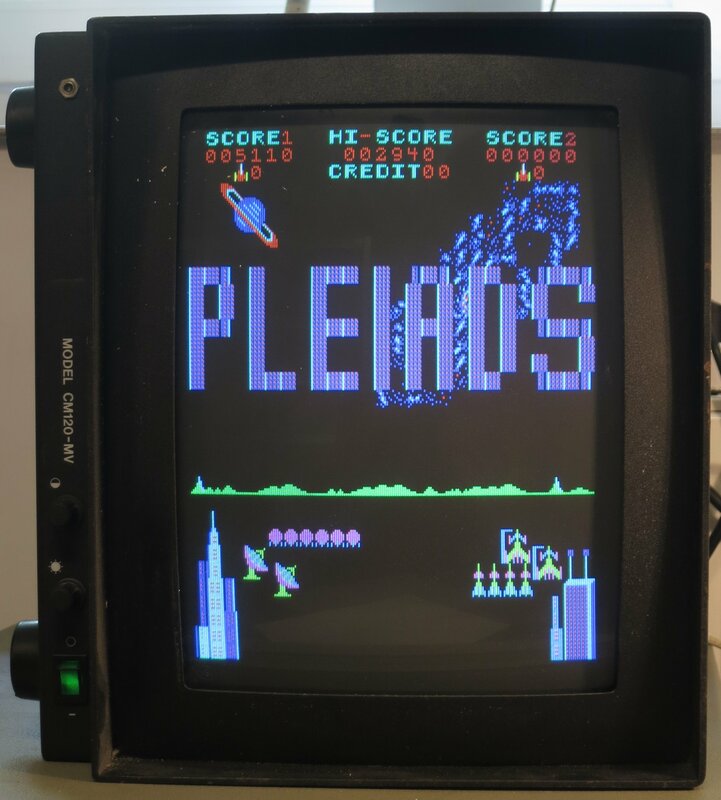 This entry was posted in Arcade, Projects and tagged analogue, arcade games, electronics, vintage on September 16, 2014 by martinjonestechnology. Why on earth would anyone want to repair a floppy disc drive? It’s quite a while since most of us bade them good riddance and started using USB sticks and Flash memory cards. However, I still use floppies from time to time, mostly with my trusty BBC Micro which still sits in the corner of the workshop. Recently I was asked to recover some documents from some old 5.25″ BBC Micro floppy discs. The documents themselves were in an unusual format, about which more another time, but the first step was to simply get the data off the discs. The discs were 80-track ones, and I have a pair of Chinon FZ-506 80-track drives for the Beeb. 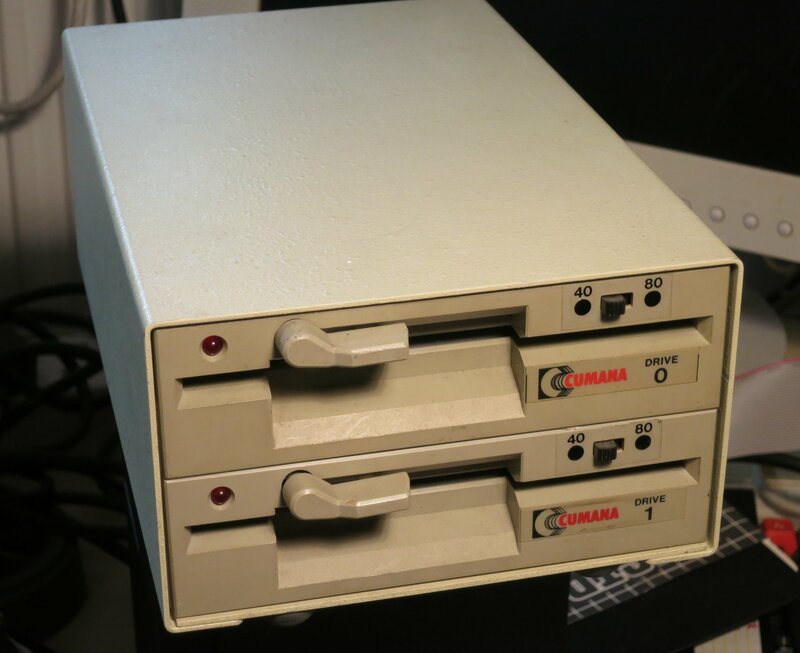 Out of all the various Beeb drives I’ve had over the years, I’ve kept these two because they’re housed in a compact casing with a mains power supply, and they have handy 40/80 track switches on the front, not hidden round the back. One drive has always been a bit reluctant to start spinning, but for occasional workshop use that wasn’t a problem. I’d got in to the habit of just opening and shutting the door a little which would kick the motor into action. However, when it came to intensive use backing up these old discs, which needed both drives, the failure to start became a real pain. I didn’t have a spare drive, and finding another one (especially in Poland) isn’t easy these days. My curiosity got the better of me and I decided to open up the drive and find out what was wrong with it. It wasn’t hard to take apart and I soon had the motor revealed. 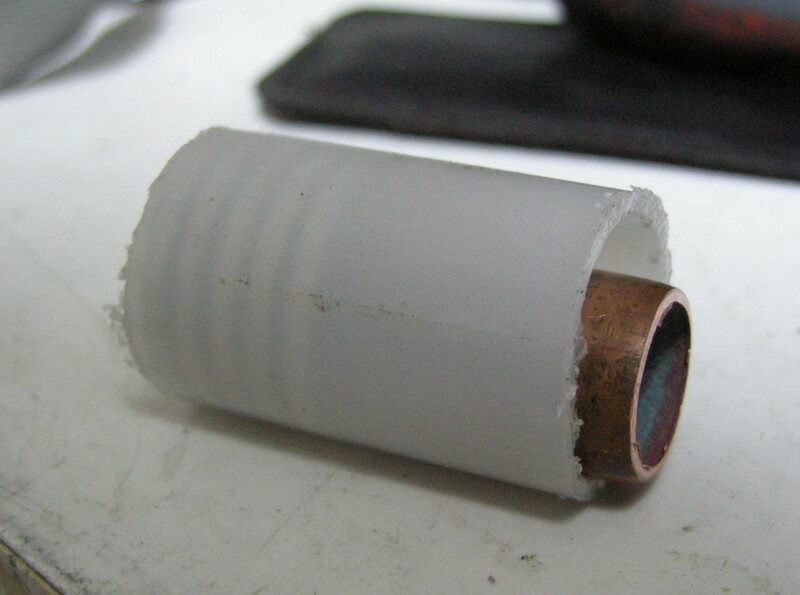 Here’s a photo of it sliced into its component parts. It’s a ‘pancake’ motor, so called because it’s (nearly) flat. The shiny silver bit on the left is the turntable which drives the disc, and it sits in a bearing. 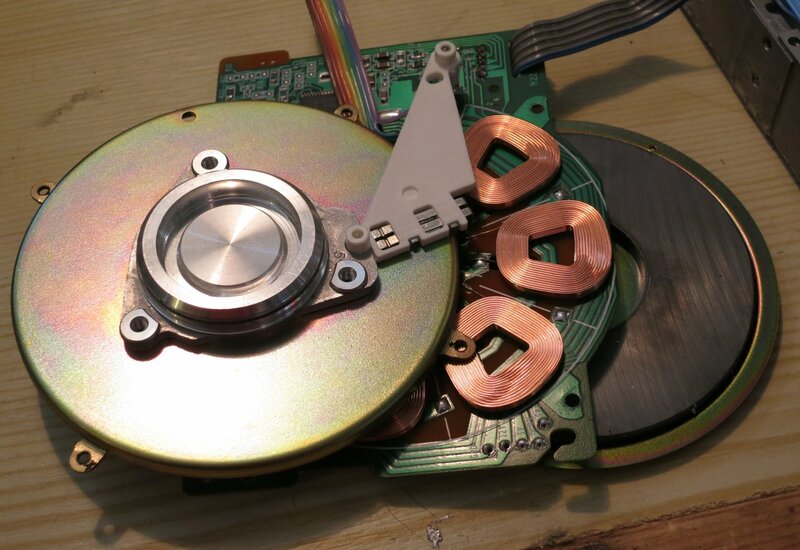 The next layer is the circuit board containing the windings and controller circuitry, and below that is the rotor which is a multi-pole magnet on a steel disc. The motor is controlled by a Mitsubishi M51785P motor controller chip. 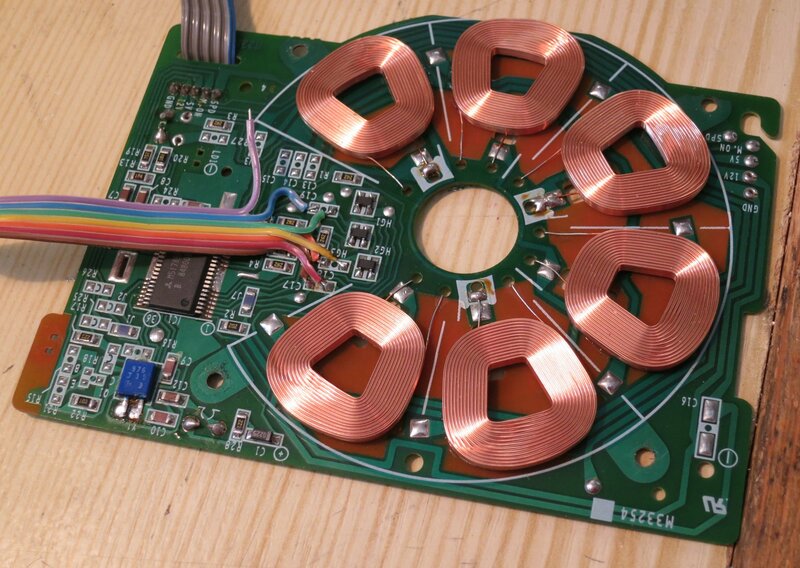 The chip’s data sheet revealed that the motor has three phases, each of which has a coil to drive the rotor round and a hall effect sensor for feedback. This particular one is arranged with two coils per phase, but occupying 6/7 of a revolution, so the motor goes more slowly than the chip is driving it. At least, I think that’s what’s going on. 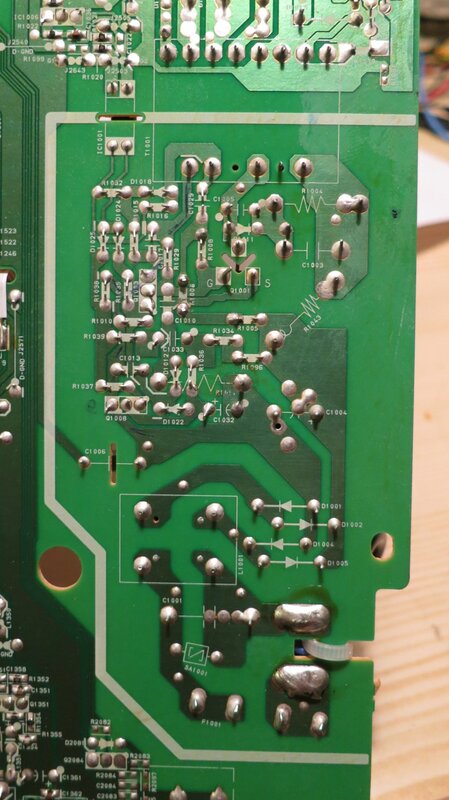 Here’s a closeup of the circuit board. You can see the six coils, and the coloured wires I soldered on to measure things while the motor was running. Because of the way it’s built, it’s impossible to access most of the circuit board while the motor is assembled. The controller chip seemed to be doing all the right things: its oscillator was running, and the outputs to the coils were doing sensible things. 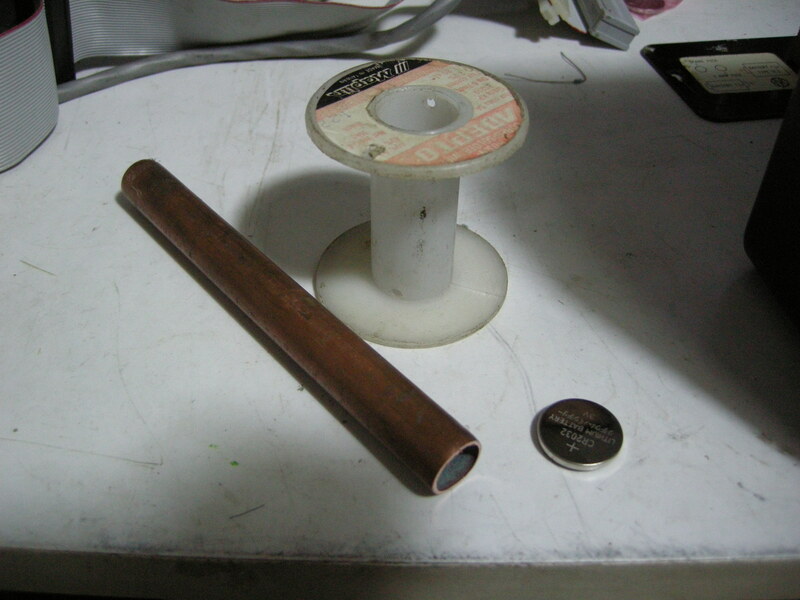 The coils themselves were all undamaged and measured the same resistance as each other. But I noticed something odd about the hall effect sensors. There are three of them, HG1, HG2 and HG3. I noticed accidentally that if I shorted together the two wires taking the output of HG1 to the controller, the motor still ran but sounded very rough. Not surprising. The same happened if I shorted the output from HG3. But shorting the output from HG2 had no effect at all. Aha! Only HG1 and HG3 seemed to be having any effect on the motor. I swapped HG1 and HG2 just to see what would happen, and the fault moved to HG1. That proved to me that I had a faulty sensor, not a faulty chip. Where to get a replacement sensor, though? This drive was made some time in the late 1980s, and I couldn’t find hall effect sensors in today’s electronics catalogues which would fit mechanically and electrically. I had a rummage around the workshop and found a scrap 3.5″ floppy drive. A squint at the circuit board revealed a suspiciously hall-effect-looking device of the right shape and size nestled next to the spindle rotor, used for index sensing. Well, it had to be worth a try. I extracted it and fitted it to the 5.25″ drive in place of the faulty one. Success! The motor now ran more smoothly, and shorting each of the hall sensors in turn had roughly equal effects, so they were now all working. Best of all, the motor started reliably every time. Interestingly it wasn’t as quiet as the other drive, but I suspect the scavenged hall sensor is optimised for magnetic fields from the side rather than the front, given how it was mounted, so it’s probably not perfect. 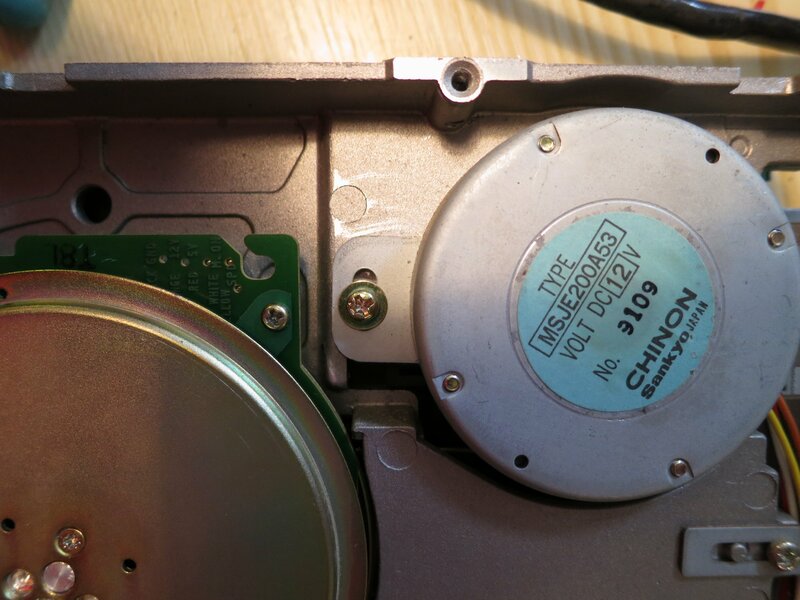 The last job was to realign the head slightly, because this drive was a bit fussy about reading some discs. I found a disc that it struggled with but that the other drive would read every time, and tweaked the position of the head stepper motor each way a little until this drive read that disc reliably. You can see in this photo that the stepper motor has elongated mounting holes, so it’s possible to loosen its screws (there’s another one just out of shot to the right) and turn the motor a few degrees to adjust the position of the head. After all this work, the drive read all the discs I asked of it without any problems. I hope it’ll be OK for the next decade or two. 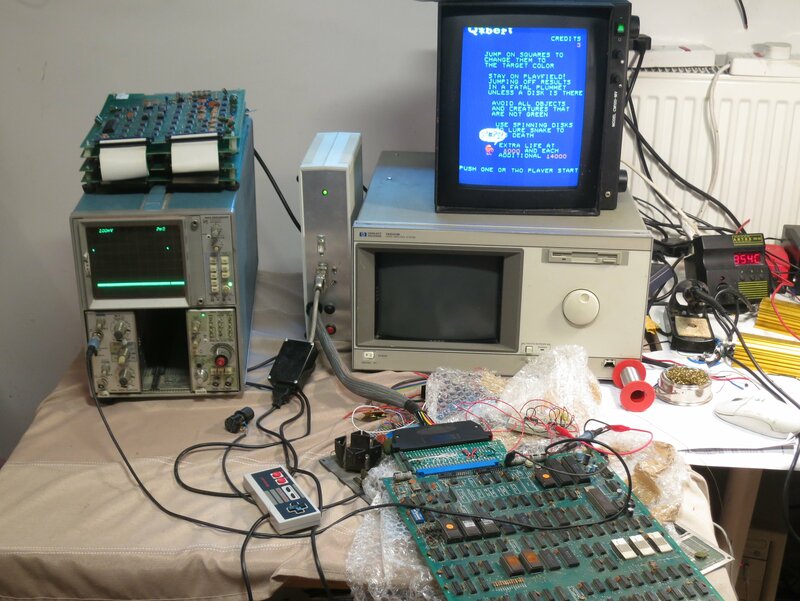 This entry was posted in Projects and tagged analogue, bbc micro, electronics, repair, vintage on April 27, 2014 by martinjonestechnology. A couple of weeks ago, my wife and I wanted to watch a movie. I went to put the DVD in the player, and was disappointed to find that the machine was dark and didn’t respond to any of its buttons. It was broken. 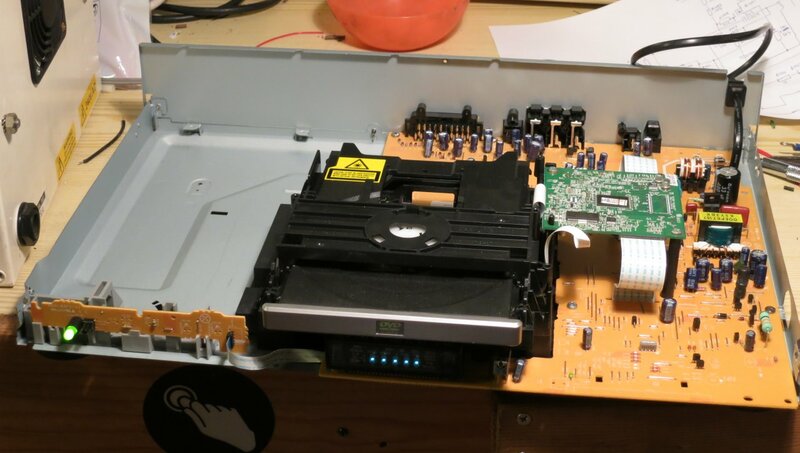 It’s hard to say that a DVD player is really worth fixing. This one, a Denon DVD-1720, is about 7 years old, and wasn’t expensive when it was new. However, I was curious to know why it had stopped working, and that alone was reason enough to delve inside. Considering its low cost (I think it cost about £100 when new) it was very neatly constructed. Removing a few screws allows the top to come off (careful of sharp edges) and the plastic front panel just unclips with a bit of gentle persuasion, revealing the guts. Before we go any further, I have to insert a health warning. Dealing with DVD player power supplies has health risks. There are dangerous voltages present inside. If you don’t have the right equipment or don’t know what you’re doing, you can get a nasty surprise, a terminally broken DVD player, a serious injury or be electrocuted. None of those are fun, especially the one which results in death. Almost all the electronics are on one big motherboard, apart from a few buttons and lights at the front and the fiddly digital stuff to do with the actual DVD reading, which sits on the green board on pillars in the middle. Undoing the screws from the green board, a few on the motherboard, all the ones on the back of the machine, and unplugging three connectors, makes it possible to wiggle the board free. It’s a bit of a squeeze and the board is fragile, so don’t blame me if you break it. The power supply is at the rear right corner. Denon have kindly marked in white the area with dangerous voltages in it. There’s not much to it. It’s clearly a switch-mode flyback converter. The transformer is much too small to be an ordinary mains transformer, and there are no inductors on the secondary side. I did the obvious checks – the fuse wasn’t blown, and the three big pale blue safety resistors measured OK. All the diodes dioded too. Time to put my reverse engineering hat on and dig deeper. 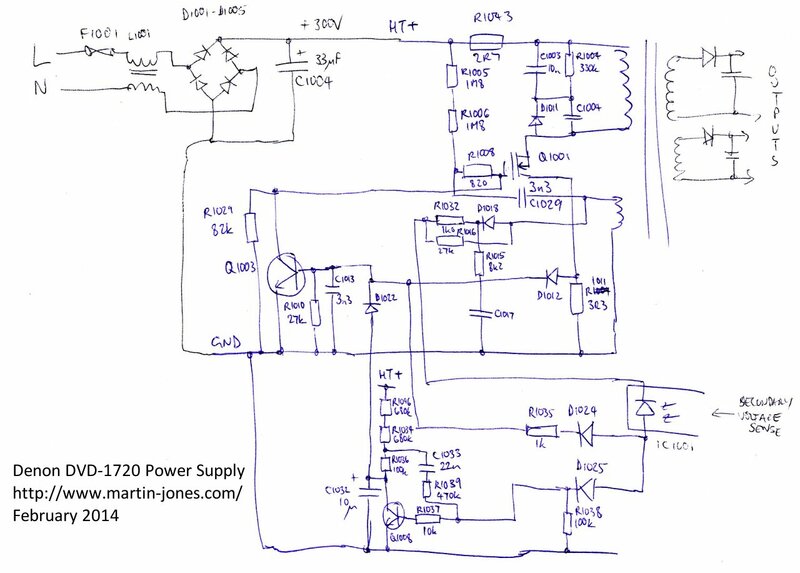 so it wasn’t too hard to draw out the circuit diagram. It’s a pretty elegant design, using only three transistors. The circuit appears to be a blocking oscillator centred around Q1001 and the transformer. At startup, Q1001 is allowed to conduct, and current starts to flow in the transformer primary. At a certain current, the transformer’s core will saturate so the current can’t increase any more. The voltage induced by the changing core flux in the feedback winding at the bottom of the transformer will suddenly drop, creating a pulse which, fed via C1029 to the gate of Q1001, switches it off. At that point the energy stored in the transformer core has to go somewhere, and it finds its way out through the secondary rectifiers into the outputs. The basic scheme is very similar to the Joule Thief, a simple blocking oscillator for driving LEDs from batteries. The two transistors Q1003 and Q1008 seem to be involved in regulating the supply. Q1003 can cut off the gate drive to Q1001 in response to three things: the current in R1001 getting too high, the optocoupler IC1001 conducting too much (which indicates that the output voltage is too high) or Q1008 stopping conducting. The latter seems to be a way of shutting down the supply if its output voltages get low, or it might be a cunning standby mechanism involving some more stuff on the secondary side which I haven’t investigated. C1032 seems to be there to make sure that the power supply starts up. I powered the bare motherboard from an isolating transformer (don’t try this at home, folks, unless you know what one of those is and how to use it) and measured some things. There was precisely no activity going on at all, apart from 300V on the reservoir capacitor C1004 and Q1001’s drain, as expected. I first laid the blame on the little electrolytic C1032, since they’re the most unreliable components in any modern electronics, but tacking another 10uF across it didn’t help. Holding my breath and briefly shorting C1032 didn’t bring anything to life, either. Then I measured some of the DC conditions. Everything around Q1008 was OK, with R1096 and R1034 merrily feeding electrons into Q1003’s base and keeping Q1001 switched off. High-value resistors are the next most suspicious components in a circuit like this, especially when they’re teeny-tiny ones. I checked around the 1.8 megohm R1005 and R1006 which pull up Q1001’s gate. Clearly it couldn’t work without them. 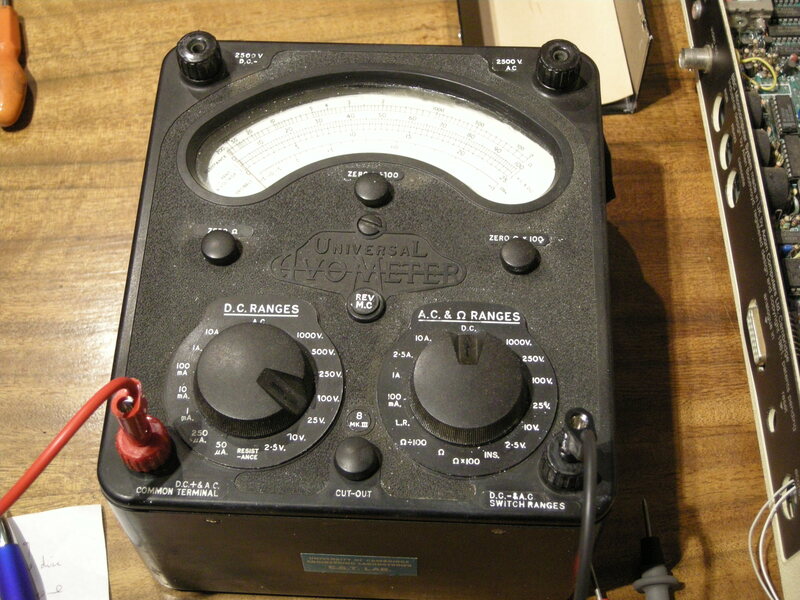 Lo and behold, my 10 megohm input meter showed 250V at the junction of R1005 and R1006. 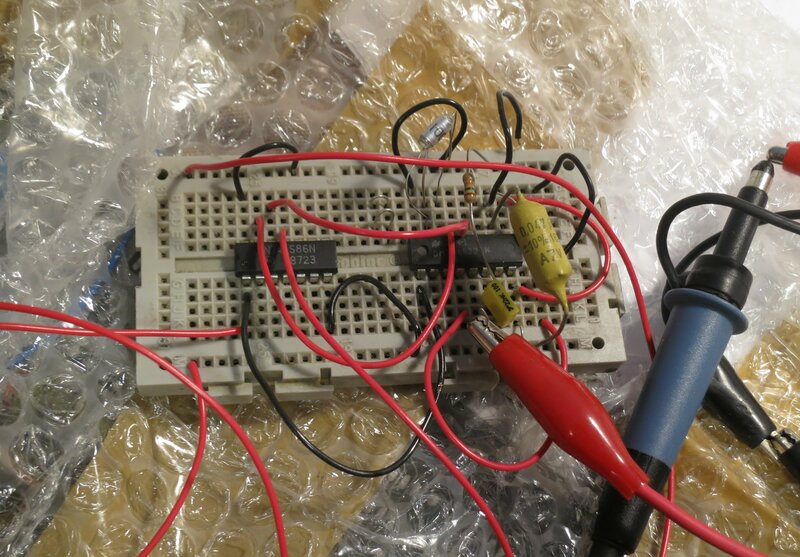 That can’t be right – the voltage should be more like 150V, since the resistors are the same value and basically connected straight across the 300V supply. I pulled R1006 out of its hiding place and measured it – it was open-circuit. Gotcha! Soldering in a replacement 1.8 megohm resistor for R1006 brought the whole thing back to life. The secondaries seemed to have sensible voltages on them (3.3V and 12V at a glance) so I reassembled it far enough to test. It lit up, accepted a disk and played it. Success! 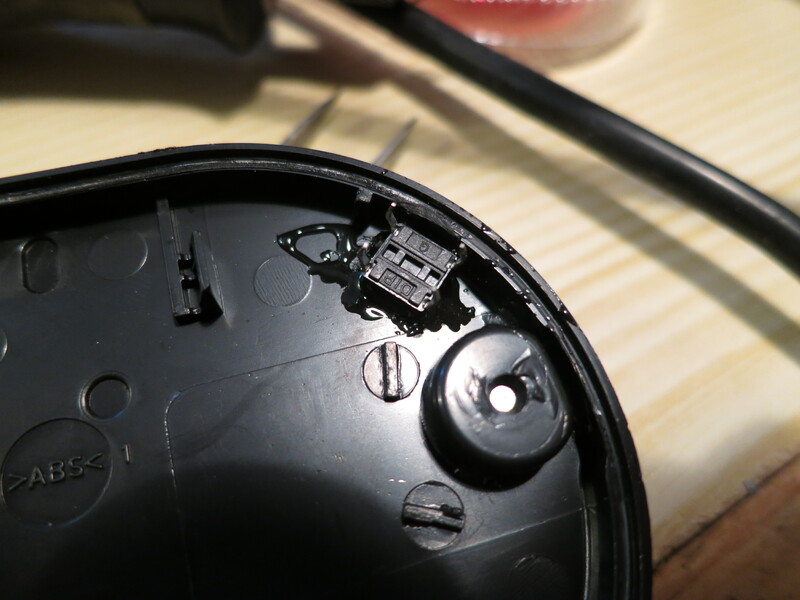 It’s a credit to Denon’s neat design that there were no screws left over when I put it back together. The whole machine is now back in action for the sake of a 2p resistor. 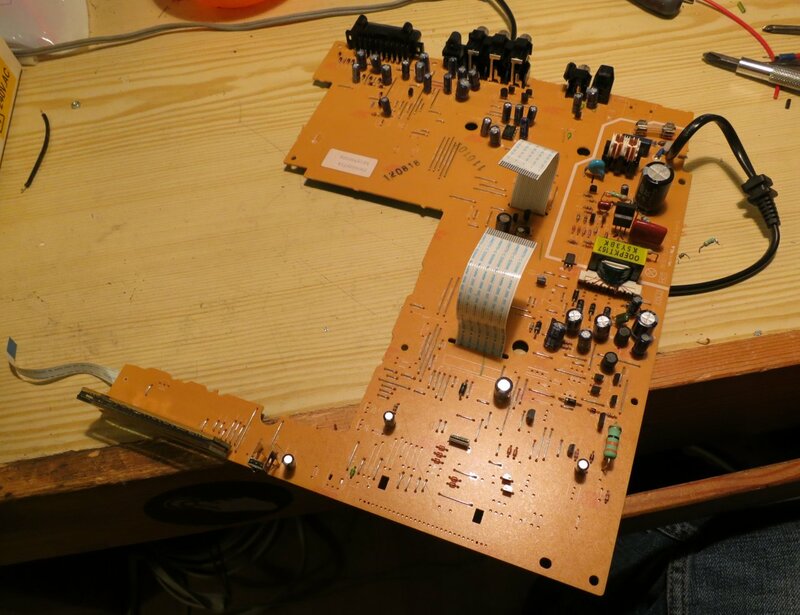 This entry was posted in Uncategorized and tagged analogue, electronics, power supply, repair on March 3, 2014 by martinjonestechnology. 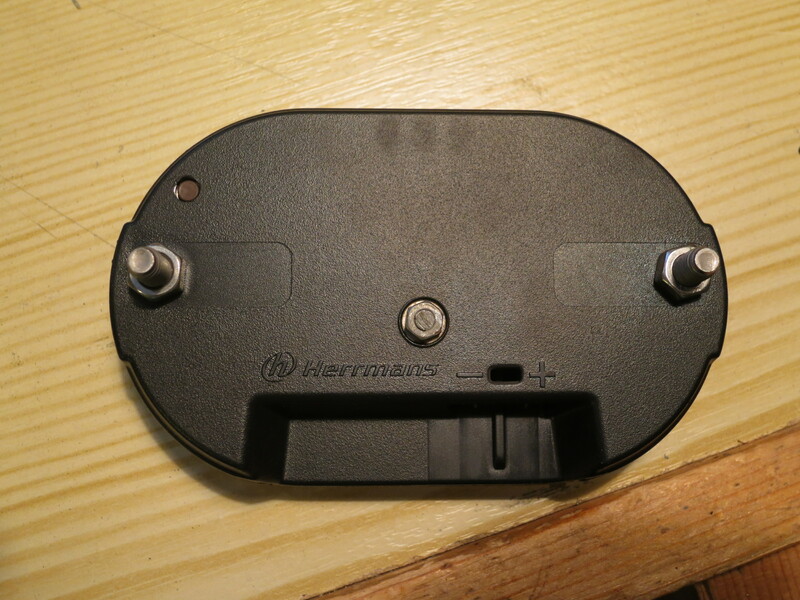 In a previous article, I took apart a Herrmans H-Track dynamo rear light. I wasn’t happy with how the standlight behaved: it stayed on for a very long time. Even after an hour, some glow was still visible. This is more irritating than helpful because it attracts attention to the bike when it’s parked, and many times has caused people to helpfully call, “You’ve left your light on” to me when I’ve locked up my bike. I also saw recently a poster at a railway station telling cyclists, in no uncertain terms, to switch off their lights when wheeling their bikes on station platforms – apparently there’s a real risk of causing trouble. Train drivers are highly attuned to spotting red lights, and so having extra ones on wayward bicycles is a safety problem. For these reasons I wanted to get some sort of control over the standlight. The German StVZO regulations (section 67, Technische Anforderung 4) say that the standlight should stay on for at least 4 minutes, so I made that my target. Most such problems these days seem to get solved with an Arduino, but that’s really boring. I wanted to do it the old-fashioned analogue way. 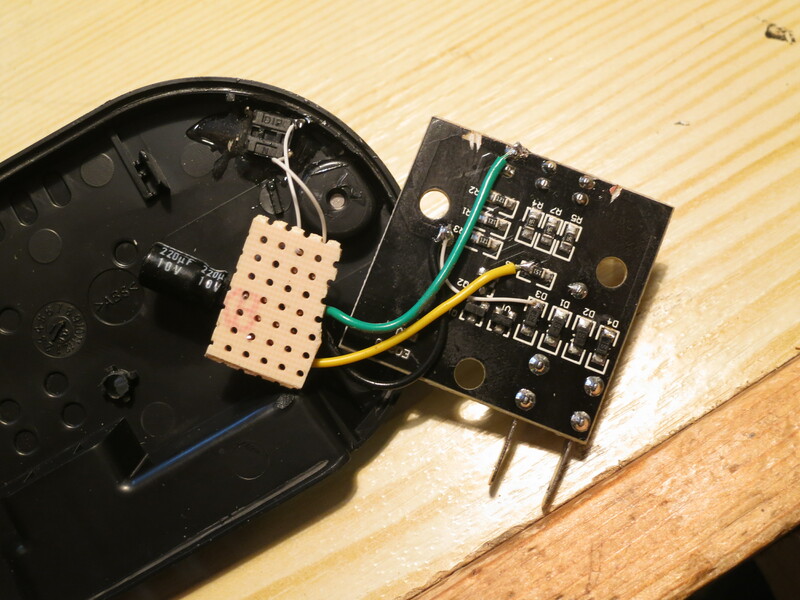 After a bit of playing around, I came up with a little circuit which automatically switches off the standlight after 4-6 minutes, and also has a button to switch it off manually. It only uses seven components. Here’s the schematic diagram. It’s a simple monostable multivibrator made of two transistors. When the dynamo is generating power, capacitor C100 charges up via resistor R100 and diode D100. It only charges to about 5V because there’s a 5V-ish zener diode in the main light. The voltage on C100, and thus Q101’s gate, keeps Q101 switched on so the LEDs light up. Because Q101 is conducting, there’s very little voltage on its drain, so Q100 is switched off. Meanwhile, in the original electronics of the light, the standlight capacitor is charging up so that the LEDs still get a power supply when the dynamo stops. When the dynamo does stop generating, C100 no longer receives any charge but instead starts discharging through R102. Because C100 and R102 are both large, and Q101’s gate has a very high resistance, this takes several minutes. 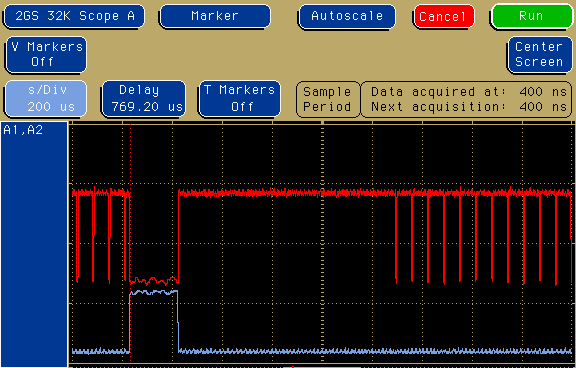 But eventually the voltage on C100 drops low enough (about 1.5V) so that Q101 starts to turn off. As it does so, the voltage on Q101’s drain starts to increase, which gradually switches Q100 on. Once Q100 starts conducting, C100 also discharges through R101, so the whole process accelerates. Q100 and Q101 thus form a sort of Schmitt trigger, which switches off Q101, and therefore the LEDs, fairly quickly at the end of a timing period of a few minutes. The button S100 is there so that it’s possible to manually discharge C100 and switch the light off, for example when parking the bike. Note that this doesn’t discharge the standlight capacitor so, next time the bike starts moving, the standlight will already be at least partially charged. This is handy. None of the components are critical. D100 can be any small-signal silicon diode, and Q100/Q101 are just logic-level N-channel MOSFETs. I built the circuit on a little piece of matrix board. It fitted easily into spare space in the light. Here are the connections to the original light PCB. The green wire goes to the LED cathodes. You can make out where I’ve rather untidily cut the original PCB track to the LED cathodes. I had to cut it in two places because it was used as a ‘through route’ from the rectifiers to the rest of the electronics. The resulting gap is bridged by the bit of white mod wire soldered to D3. Fitting in the button, S100, was a bit more tricky. I ended up using a miniature PCB-mounting button and gluing it in into the back of the case using epoxy resin. The button protrudes through a little hole but is doesn’t stick out. I’m hoping that will protect it from damage but still make it easy to use. The brown button is visible at the top left of this photo. When the light is mounted on the bike, it’s still accessible. I’ve been using the modified light for a few days now and I’m pleased with it. The light itself is very bright, so being able to switch it off when I stop to buy bread is properly handy. 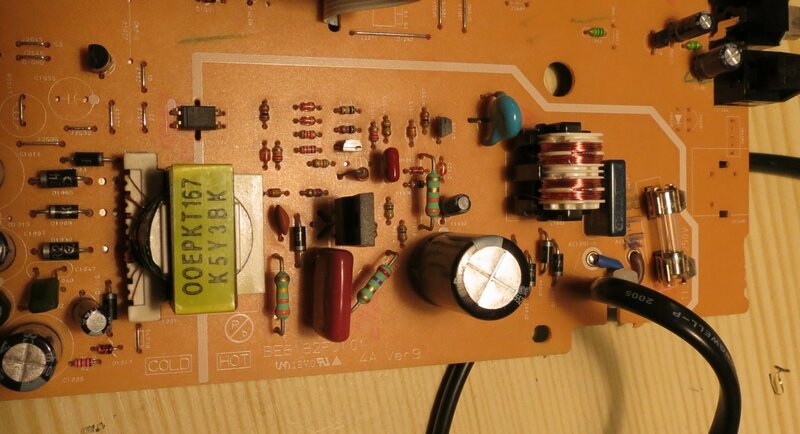 This entry was posted in Projects and tagged analogue, cycling, electronics on February 7, 2014 by martinjonestechnology. The Avometer 8 multimeter has lots of useful ranges, including a special high-resistance range which can measure resistances of up to 20 megohms. This is handy, but it needs a special 15 volt battery. 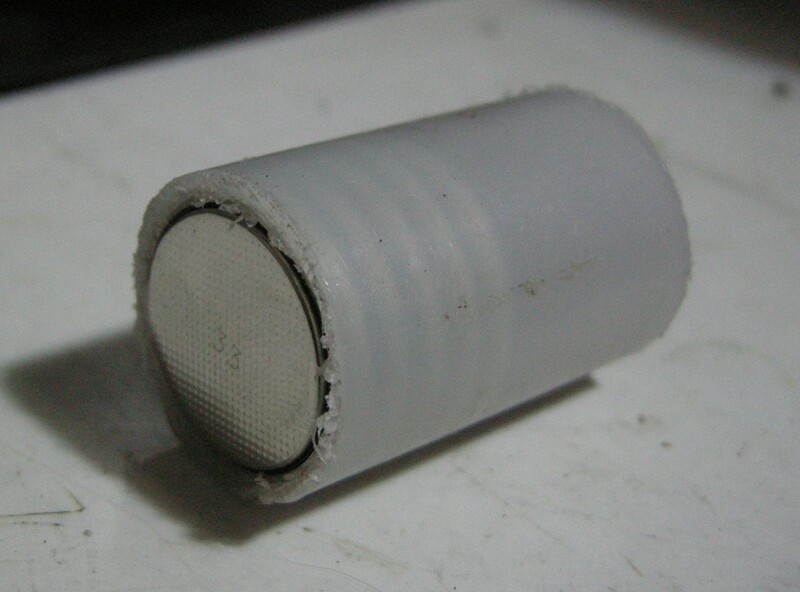 The battery it’s designed for is a BLR121, which was once fairly common but is now dying out. The BLR121 is just about still available but it’s expensive, and since the meter is likely to last a long time I wanted a battery which would also last, and be easy to replace when necessary. 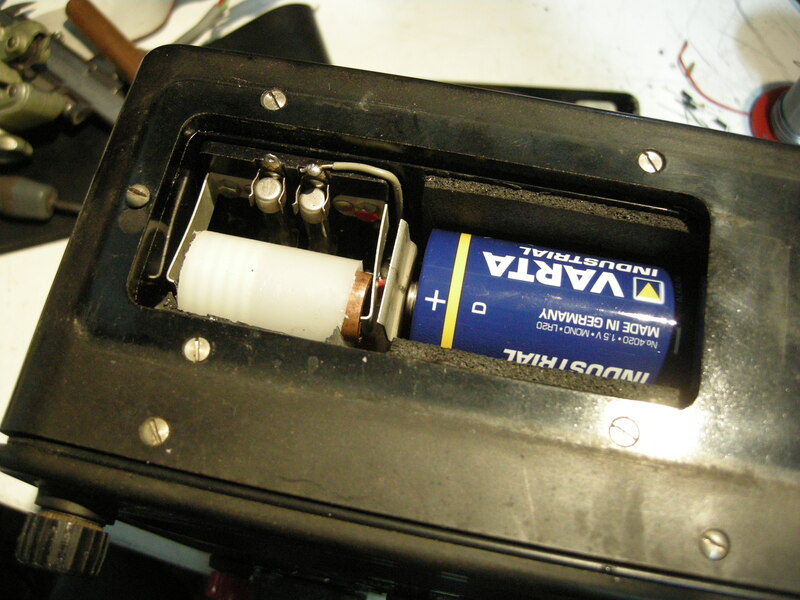 It fitted just neatly into the battery compartment of the meter. The spring contacts are very convenient because you can fit more or less any shape between them! It works perfectly, and it’s cheap. The CR2032 cells are available for less than 50p each if you shop around, and they have a capacity of around 200mAh. The BLR121 replacements I’ve seen have a capacity of only 40mAh, so the lithium replacement should last about five times longer. Not bad. Here’s a gratuitous picture of the Avo in use checking the power supply of a BBC Micro. This entry was posted in Uncategorized and tagged analogue, electronics, test equipment, vintage on July 31, 2013 by martinjonestechnology.